[BOSTON PORT ACT]. Newspaper. The Boston Evening-Post, June 6, 1774, No. 2019. Boston: Thomas and John Fleet. 4 pp., 9¾ x 15⅜ in. The majority of this paper is devoted to patriotic content. 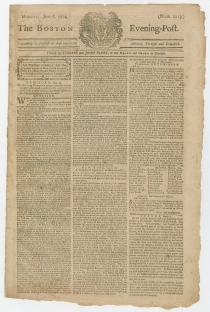 The front page features a series of Questions and Answers from New York “being conceived, in some measure calculated to advance the cause of freedom, in the present critical situation of affairs.” It goes on to note that “A Congress of Deputies from the several Colonies is thought to be absolutely necessary to devise means of restoring harmony between Great Britain and the Colonies, and prevent matters from com[ing] to extremities” (p1/c1-2). “A Friend to Mankind” wrote to the publishers, “When I first read the barbarous Act for shutting up the port of Boston; an act made with the pious design, to starve the poor; make the industrious, idle; the happy, miserable; and as an entering wedge to the horrid purpose of enslaving America, although I was transported beyond measure, I could not help reflecting, that bitter as it was for the present, it would absolutely be of happy tendency to America, in the result...” (p2/c1). This issue prints a May 25 address from 33 Marblehead loyalists congratulating Massachusetts Gov. Thomas Hutchinson on his administration and wishing him a safe return trip to Great Britain (p1/c3). On the other hand, a public meeting in Marblehead denounced the address and declared Hutchinson “an inveterate Enemy to the Liberties of the Province” (p2/c3). 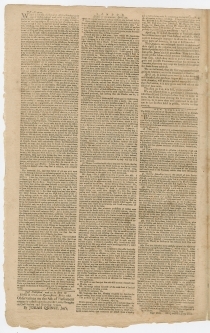 This issue also announces from Boston, “the Corporation of Harvard College have voted that considering the present dark Aspect of our public Affairs—There be no public Commencement this Year—and that the Candidates for the first and second Degrees, shall receive their Degrees in a general Diploma” (p3/c1). On May 1, 1775, less than two weeks after the Battles of Lexington and Concord, the faculty of Harvard dismissed the undergraduates early for the summer vacation, again without a public commencement. Classes did not resume until October in Concord, twenty miles away, where students boarded with local residents, and college courses were held in a deserted grammar school, the courthouse, and the First Parish meetinghouse. Meanwhile, the five buildings of the college’s campus in Cambridge housed 1,600 American soldiers. After the British surrendered Boston in March 1776, and the American troops moved south to defend New York, the college was permitted to reoccupy its buildings in June. Of 190 freshmen entering between 1775 and 1778, only 30 left prior to graduation. 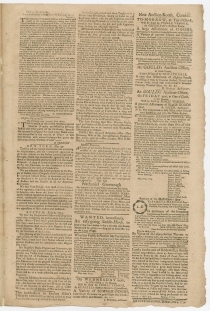 An advertisement is included for a just-published pamphlet, Observations on the Act of Parliament, commonly called the Boston Port Bill, with Thoughts on Civil Society and Standing Armies (p2/c1). From September 1774 to March 1775, Josiah Quincy II (1744-1775) was in England, arguing the American cause to sympathetic British politicians. He died of tuberculosis on the return voyage, within sight of Massachusetts. Relief for Boston was sent from as far away as South Carolina, and the First Continental Congress convened in Philadelphia three months later to coordinate a colonial response to the Intolerable Acts. Parliament finally repealed the Boston Port Act in 1783, after fighting ceased in the American Revolutionary War, but before the Treaty of Paris officially ended the war and recognized American independence. Near fine; several professional mends to gutter margin. 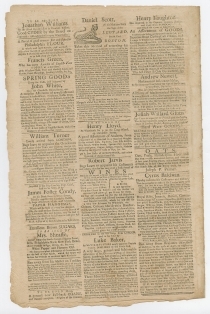 A bright and attractive issue of an important colonial newspaper. Full text of the Boston Port Act. Full text of Josiah Quincy II, Observations on the Act of Parliament, commonly called the Boston Port Bill, with Thoughts on Civil Society and Standing Armies.